Well . . . almost everything. Everything You Always Wanted to Know About Long Term Food Shelf Life - Well, almost! The shelf life of foods is a huge concern to anyone who is serious about long term food storage. Because we are storing so many types of food products, questions always come up about how long it will last on the shelf, if opened, if bought at the grocery store, or how to best package it. This page contains questions and answers about food shelf life from my readers. I very much appreciate them asking because there is always something we can learn — yes, even me. Sometimes I need to research the answers, which only increases my knowledge. Food Storage Chart - This chart includes a long list of foods and their shelf life that you may store in your pantry, refrigerator or freezer. Food Shelf Life - This page gives you the shelf life of food items that you might store for up to three months in your pantry or cupboards. Long Term Food Shelf Life - This page contains a chart for the shelf life of long term foods, such as beans, wheat, flour, honey, oats - and many more, as well as how to store them. If you still have questions after reading here, feel free to use my contact form. The Problem of Different Storage Shelf Life "Times"
I've been doing research on the shelf life of various foods and I've found that each website has different storage life "times" (years/months). This is very frustrating! With each website having a different time, how do you know who is correct? It depends on the food product. Freeze-dried and dehydrated foods that have been packed by a reputable company in #10 cans have been tested and tested. They all found that these foods will still taste good after 25-30 years. The operative word here is "taste". A study was done at Brigham Young University on shelf life of foods and they found that many foods will last years longer than previously thought by everyone (some as long as 50 years). But did they "taste" good? Were they nutritious? Somewhat to both questions, but they were edible, would probably keep a person alive, and were not rotten or contaminated. The "use by" date on food at the grocery store is only a date for the store (required by law). They are not allowed to sell the product after that date. But that doesn't mean it isn't good to eat after that date. Home canned foods? Some say 1 year - some say more. You just have to use your best judgement. If after 1 year you open a bottle of something and it "smells funny" or has a bulged or unsealed lid, toss it and check all other bottles canned at the same time. 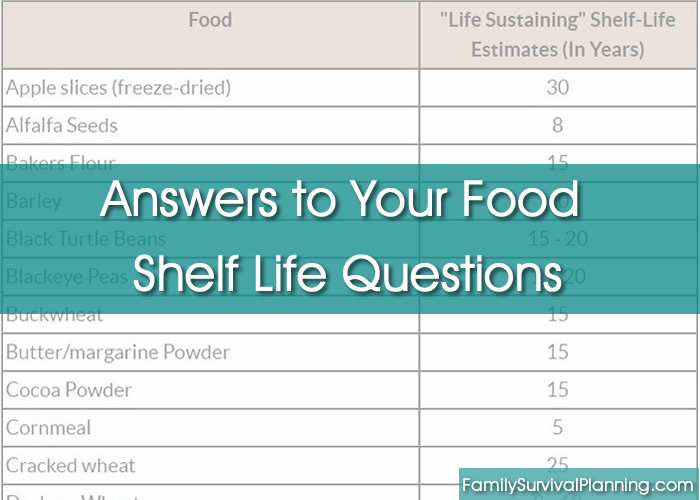 If you look at the chart on my Long Term Food Storage page, you will notice that it says in the title of the right-hand column, "Life Sustaining Shelf Life Estimates". Why "life sustaining"? That means that after the time listed, there is no guarantee the food will be nutritious; therefore, no longer life sustaining. Shelf life estimates? Because the times listed are estimates. There are no hard and fast rules about shelf life and there are many variables to consider. My best advice is to just use your own good judgement. There's a list of Signs of Spoiled Food HERE if you are interested. Can I extend the shelf life of dry cereals by using O2 absorbers and Mylar bags? Can boxed cereal such as Life cereal be vacuum sealed in a jar, and how long is the storage life? The shelf life of an unopened box of cereal from the store is about 1 year (2-3 months if opened). I would think putting it in Mylar bags with O2 absorbers would extend the shelf life into years. How many? I haven't experimented with it so I don't really know but it should be much longer than a year. Food storage companies now have the familiar grocery store cereals packaged in Mylar and sealed into 5-6 gallon buckets, so I would assume, properly packaged, they will last many years. Now you can have your favorite grocery store cereals packaged for long term storage. Can I store brownie mix for three years if put in a food saver bag with oxygen absorbers? Do you need to heat the lids before using? What is the shelf life when doing it this way? If it does, then you should not store it long term. Anything containing oil or fat will go rancid in a relatively short time. Also, about the FoodSaver bags: If they are vacuum sealed, you won't need oxygen absorbers. Do one or the other as they do the same thing - eliminate oxygen. I store my brownie mix in canning jars, vacuum packed with a FoodSaver using the attachment for jars. But I mix my own and do not add any fats and oils. No need to heat the lids. But you must use the FoodSaver specific attachment as shown HERE; OR put in an oxygen absorber and tighten the lid. It should still seal, but check to make sure before storing. Mountain House pouches have a shelf life of 7 years. Will the food still be good after that 7 years and is there a way to extend the shelf life? We recently tested archived samples for nutrition, flavor, and texture, and found them to be virtually indistinguishable from new production, the very definition of “shelf life”. Effective immediately, the official shelf life of Mountain House pouches has been increased by over 40%, from 7 years to 10 years! We also tested Mountain House pouches that were 30 years old. While there were recognizable differences in flavor and texture from new production (and therefore past their “shelf life”), the food was still delicious, wholesome, and nutritious! In fact, our tasting panel found that 30-year old Mountain House food significantly outscored newly manufactured competitive products in a blind sensory evaluation. We are confident that Mountain House provides consumers with the longest proven shelf life in the industry, as well as the longest proven storage time: our food remains not just barely edible, but delicious! However, Valley Food Storage pouches are packaged to last 25 years. But when does that 25 years start? Every one of their pouches has the date when they were packed and sealed. The date is printed on the seal. The letters indicate the facility it was packed in. The first 3 numbers are the day of the year that it was packed ( January 1st = 001, December 31st = 365) and the final 2 numbers are the last 2 digits of the year it was packaged. I bought 12 boxes of "Pro-Vita" nitrogen packed dehydrated food in 1982. I have never opened it. It is still in the cans. Before I throw it out, and purchase new food, is what I have still ok to eat, if it has never been opened. It is 30 years old. I would say, yes, it's still good - with qualifications. Brigham Young University published some research recently where they tested freeze dried and dehydrated food that was over 30 years old. It tasted okay but they found that it was not as nutritional as when it was new, or even 10-20 years old. So, I would advise you to open some and if it smells okay, taste a little and see what you think. It is probably safe to eat. Is it nutritional enough? Unless you test it in a lab, you wouldn't know for sure, but it is likely not very nutritious. The accurate definition of "shelf life" should be: will it give a person life, or not. If not, then its shelf life has expired. What is the shelf life of beans if put into jars? I am preparing for long term use. I do have 5 gal. buckets but no Mylar bags or oxygen absorbers yet. Should I just wait and do it that way instead of the jars? It's just me, no other family to help eat it and I don't know if it would actually be a benefit for me to use the buckets. Because there is just you, the jars will work fine. Just throw an O2 absorber into the jar and tighten the lid. It should seal just as if you had canned it in a canner. Or seal it with a FoodSaver jar attachment. You might also make Mylar bag packets. Cut the Mylar bags just big enough to hold a portion or two for yourself. Put in an O2 absorber and seal it up. Be sure to write on the packets what is in them and the date you packaged them. How long of a shelf life can I expect for canned chicken? Is it a realistic option for something I can be doing in addition to freeze dried and dehydrated food? Yes, it is a very realistic option. All canned food products "should" be used within about two years - at least that's the suggested shelf life. But studies have been reported by the FDA and the U.S. Army where canned foods that were 100 years old were still edible (these were factory canned - not home canned foods). The food had lost some of the nutrients (like vitamin A & C) but still had sufficient protein and calcium. Although the food had lost its fresh smell and appearance, the chemists detected no microbial growth and determined that the foods were as safe to eat as they had been when canned more than 100 years earlier. A canned food shelf life study conducted by the U.S. Army revealed that canned meats, vegetables, and jam were in an excellent state of preservation after 46 years. The key, of course, is that the cans show no signs of bulging or leakage. If a can is bulged, even a little bit, throw it out. How long will food last if canned in a pressure cooker? It varies depending on the specific food product and storage conditions (cool 40 F- 60 F and dark is best). I’ve found that most canned vegetables and fruits retain good quality for at least 12+ months. Applesauce and apple butter are good for 2 or even 3 years. Jams and fruits should be good for about a year, while pickles can be tasty for 2 years. As long as jars remain sealed, they are probably safe to eat for 2 or 3 years. But usually, after a year, the quality declines, they get mushy and less tasty, so while they’re still safe, you may not want to eat them.